The Milwaukee Brewers announced today that they have reacquired right-handed relief pitcher Jeremy Jeffress from the Texas Rangers in exchange for right-handed pitcher Tayler Scott. The 29-year-old Jeffress returns for his third stint with the Brewers (2010 & 2014-16). He was traded by Milwaukee to Texas last August 1 as part of a five-player deal (Lucroy trade). he was originally selected by the Brewers in the first round (16th overall) of the 2006 First-Year Player Draft. Jeffress is 13-6 with a 3.31 ERA and 28 saves in 249 career relief appearances with Milwaukee, Kansas City, Toronto and Texas, including a 1-2 mark with a 5.31 ERA in 39 appearances with the Rangers this season. He has gone 9-3 with a 2.38 ERA and 27 saves in 158 games as a Brewer. He served as Milwaukee’s closer in 2016 prior to being traded to Texas, converting 27 of 28 save opportunities. 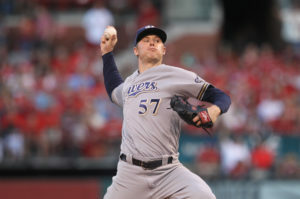 The 25-year-old Scott signed with the Brewers as a free agent on July 4, 2016. He went 4-6 with a 2.34 ERA and 2 saves in 42 relief appearances at Double-A Biloxi this season. To make room on the 40-man roster for Jeffress, outfielder Kirk Nieuwenhuis was designated for assignment. 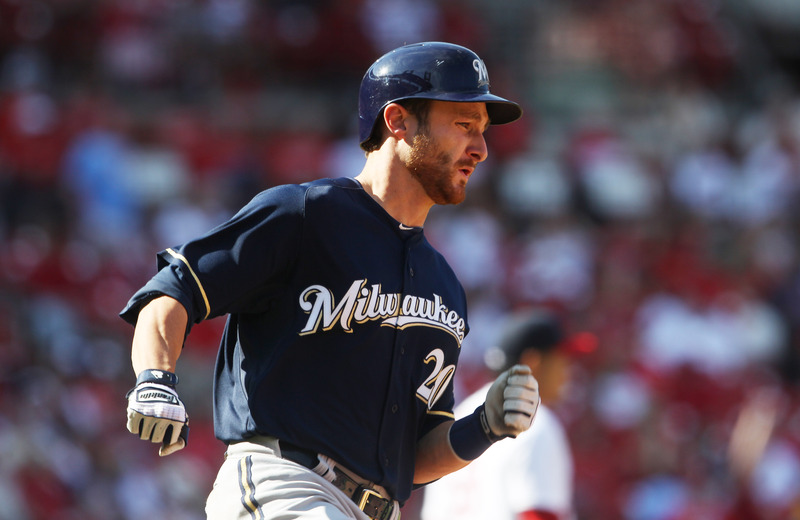 Former Brewers catcher Jonathan Lucroy was traded for the second time in the last year on Sunday. Lucroy hit .242 with four home runs and 27 RBIs in 77 games with the Rangers this season. Lucroy was a two-time all-star during his stay in Milwaukee with the Brewers. Major League Baseball’s trade deadline is this afternoon. So far, the Brewers have not pulled the trigger on any deals. According to reports, a discussion with the Oakland A’s about acquiring Sonny Gray didn’t get anywhere when the A’s were insistent about outfielder Lewis Brinson being a part of any potential deal. Former Milwaukee Brewer slugger Carlos Gomez clubbed a three-run home run in the bottom of the eighth inning off of Brewers closer Tyler Thornburg to help the Texas Rangers pull out a 8-5 win in the series finale at Globe Life Park. Gomez had three hits and reached base four times against his former club. In the series, he finished seven for 12 with two doubles, two home runs and eight runs batted in. The Brewers got to Rangers starter Cole Hamels early, scoring all five of their runs off of the Texas ace in the first three innings. Jonathan Villar hit the games first pitch for a home run, his 19th of the season. Villar needs one home run in the final three games to reach 20 home runs and 60 stolen bases for the season. The last player to achieve that plateau was Ricky Henderson in 1990. Chase Anderson worked five innings and wasn’t involved in the decision. He went 5-1 with a 2.56 ERA over his final 12 starts. For the season, Anderson finished 9-11 with a 4.39 ERA. The Brewers get the day off today. They’ll close the season with a three-game weekend series in Denver against the Colorado Rockies starting Friday night. Just one day after catcher Jonathan Lucroy vetoed a trade to the Cleveland Indians, the Milwaukee Brewers dealt him, along with reliever Jeremy Jeffress to the Texas Rangers just before the 3 p.m. trade deadline. In return, the Brewers acquired the second and third rated prospects in the Rangers system. Lewis Brinson is rated number-2 and right-handed pitcher Luis Ortiz is rated number-3, as well as the best pitching prospect in the Texas organization.